Welcome back to the galaxy far, far away. 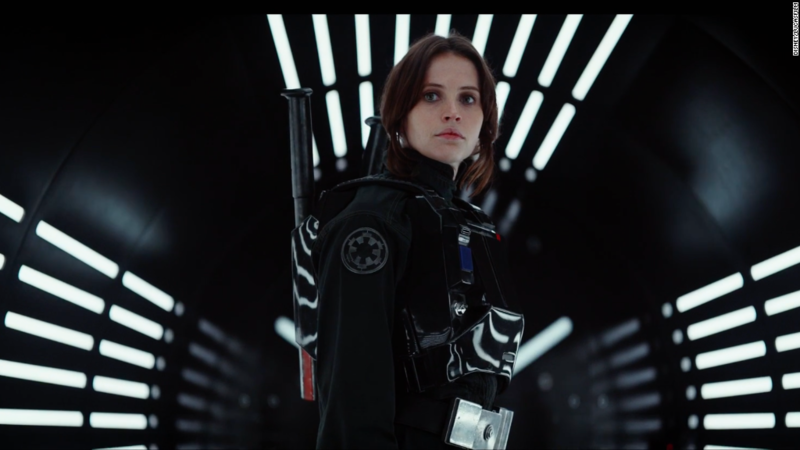 With the brief teaser, Disney (DIS) gave fans the first glimpse of the new "Star Wars" film starring Felicity Jones. It takes place in the universe of Luke Skywalker, Princess Leia and Han Solo. But "Rogue One" is a bit different than your average "Star Wars" film. "Rogue One: A Star Wars Story" premiered its first teaser trailer on ABC's "Good Morning America" on Thursday morning. "Rogue One" looks to rack up a big box office, but from the looks of the trailer, it appears to be darker than what fans are used to. This would stay in line with director Gareth Edwards' description of "Rogue One" as a war film. The spinoff is the first "Star Wars" film to be released by Disney since December's hugely successful "Star Wars: The Force Awakens." "Force Awakens," the seventh film in the original franchise, was one of the biggest blockbusters ever. The film, starring Daisy Ridley, John Boyega and Harrison Ford, made over $2.06 billion worldwide.